Development of the Cesium mapping platform is happening fast. The software is now the obvious choice for visualizing spatial data on the web. With strong support from AGI, Cesium development has accelerated since the version 1.0 release in August of last year with new updates every month. Recently, major attention has been given to help provide the same user experience in Cesium as was possible with the Google Earth API. Support for KML, flyTo Camera controls and easy ways to draw placemarks and labels on the map are just a few of the latest updates. Thorough blog posts have been published to help developers use the latest functions. With the recent updates to Cesium there are no longer any technical limitations that make any commercial mapping products a reasonable alternative. In fact, the stability of the Cesium map and rapid, high quality graphics make Cesium the indisputable choice to delivering web-based mapping solutions. The AGI development team has recently ported the famous Google Earth Plugin site Monster Milk Truck to Cesium. Dennis Wegewijs, the creator of Cycling the Alps has ported his application to Cesium as well. This is evidence that Cesium is a logical alternative to migrating complex GIS web applications and can provide a consistent experience to Earth. These converted applications are especially valuable for developers to see how logic written for the Google Earth API can be translated to work with Cesium in a straightforward manner. When one considers that Cesium is Apache 2.0 licensed (free for commercial use), uses WebGL (native in iOS 8), requires no plugin to run in a web browser, and is cross-platform compatible, it's undeniable that this software is going to dominate 3D visualization on the web. The Cube Cities team is using Cesium to build new kinds of interactive real estate applications. We've been sharing imagery from the programs we've been developing, but soon we will be giving public exposure to our Cesium-based applications. 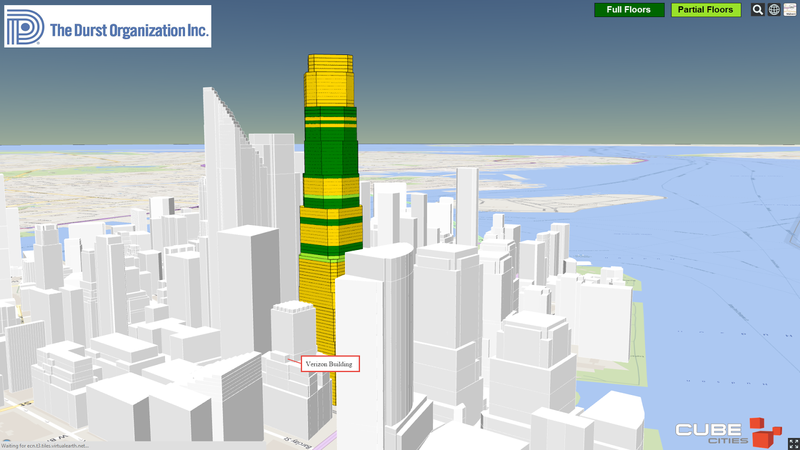 Below is a look at our building data for Manhattan with a glimpse into the new One World Trade Centre. Contact us to learn more about how Cube Cities can help migrate legacy real estate mapping products to free, Cesium-based web solutions. All content owned by Cube Lease Inc. Patents Pending. Powered by Blogger.